Fuel up, strap in and prepare yourselves for the Speedwaaagh! 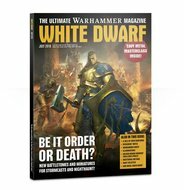 – this month, White Dwarf brings you all the lowdown on Speed Freeks, the new and Orktacular game of vehicle combat. 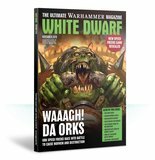 In fact, there's a rather green hue about this month in general, with a fabulous guide to kitbashing Orks, a Battle Report featuring the greenskinz vs the T'au Empire, and a dedicated Paint Splatter. 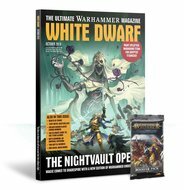 As if that wasn't enough to get your teef into, there's guidance on building a Middle-earth army, getting started with Necromunda and a 16-page Christmas gift guide. 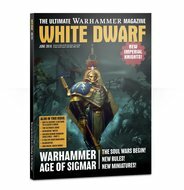 Truly, this is the ultimate Warhammer magazine! Waaagh! Dakka, dakka, dakka! Da Orks take over Planet Warhammer this month. Grombrindal out, Ghazghkull in! Wot’s he got to say? Are you ready for war in the underhive? Find out all you need to know about Necromunda right here. For nearly 30 years, Gotrek Gurnisson has sought his doom. Will he find it in Realmslayer? 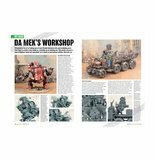 The need for speedin’ – Boss Mek Matt Holland tells us all about the new Ork vehicles while members of the ’Eavy Metal team share their thoughts on painting the new kits. Members of the White Dwarf team engage in a four-way game of Speed Freeks. Contains violence from the outset. 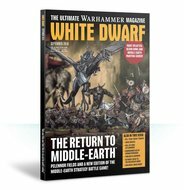 Another stunning display of miniatures from this year’s Warhammer Fest, plus interviews with the painters. 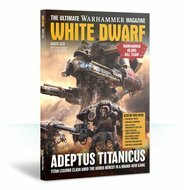 A mob of Bad Moons Orks prepares to join da great Speedwaaagh!, but a T’au Empire force stands in their way. Not Orks this time, but orruks. We take a closer look at the forces of Destruction in the Mortal Realms. Wordsmith Jay Clare joins us once again to talk about army building in the Middle-earth Strategy Battle Game. Dare ye enter the research facility of Lesotho 212? 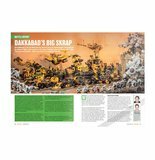 It’s an Orky kitbash, featuring converted Trukks, Looted Wagons and a Deff Dread.